Have you ever wanted to practice Grand Prix dressage or endless cross-country courses without having to find the perfect horse or tire him out? 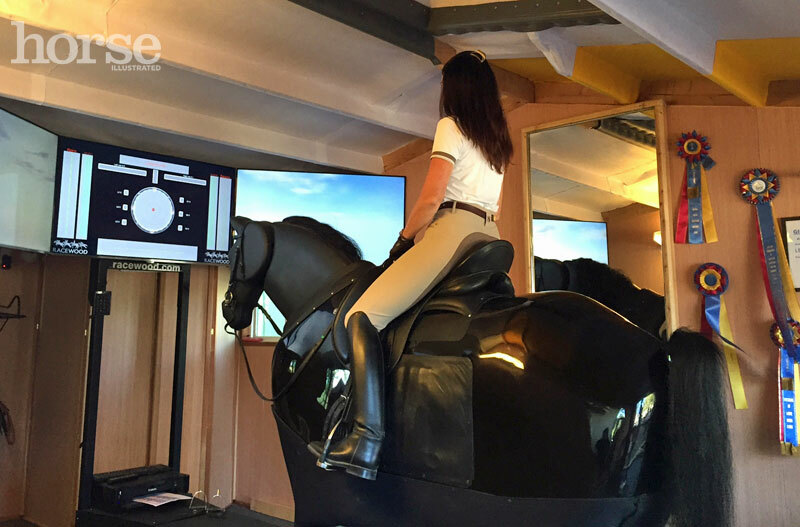 With this idea in mind, dressage trainer Barbro Ask-Upmark worked with equine simulator designer Racewood (www.racewood.com) to develop the ultimate “horse,” Dante Maximus. He is the first of his kind to perform all three eventing disciplines of dressage, show jumping and cross-country. 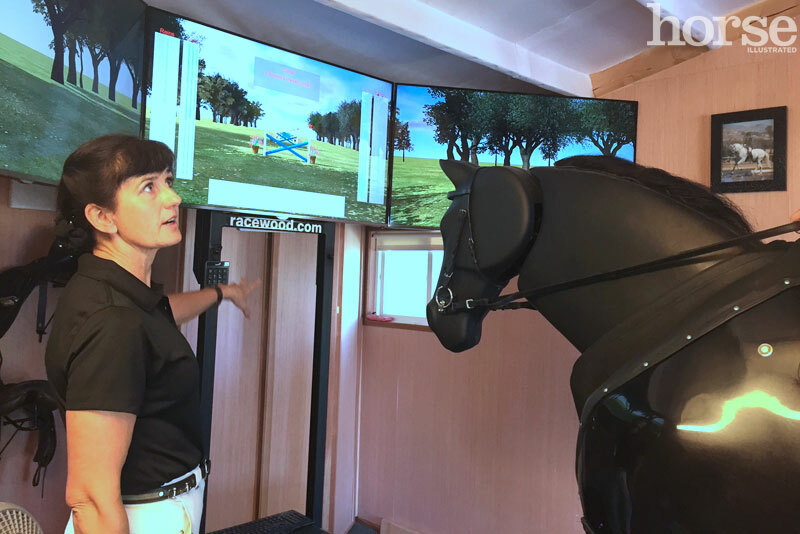 Racewood Equestrian Simulators, based in the UK, originally started making simulators to train jockeys, who have to pass a simulator test to become licensed in England. Barbro owns Dante, who is currently located at Coto de Caza Equestrian Center in Orange County, Calif., where she teaches. Coto Equestrian is best known for hosting the 1984 Olympic Pentathalon, a five-sport event that includes show jumping. Coto hosted an event in June to introduce Dante to members of the press and equine community. “Pilots and many professional athletes use simulators for skill enhancement,” says Barbro. “For sports as intricate and complex as dressage and jumping, it makes particular sense. Dressage trainer Barbro Ask-Upmark instructs a rider aboard Dante Maximus, a horse simulator that mimics the movements of dressage, show jumping and cross-country. Barbro teaches 45-minute lessons on the simulator to help riders from beginner level to Grand Prix. Many riders with fear issues feel more comfortable working on the simulator before getting back on a real horse. Barbro’s students learn where they may be off balance or hang on one rein. The first step on the simulator is to sit at the halt while looking at the balance point on screen to see if your body tilts left, right, forward or back without you realizing it. The first step on the horse simulator is to sit at a halt to discover any balance problems in your seat. Once Barbro gives you the heads-up on what to look for, she teaches you how to ask Dante for the walk, trot, canter and halt. With the basics underway, you’re ready for some real fun! I watched as dressage and show jumping riders tried out those two modes. Being an eventer, of course I couldn’t wait to get on Dante and dial in the cross-country course! It was very twisty and turny and I did miss a few jumps, go into the tall grass and even smash my face into some low branches (although this happens in real life, too). But when I cued him correctly, setting up for jumps by collecting the canter while still keeping my leg on, Dante obliged by jumping perfectly around a pretty realistic Preliminary-level (3’6”) course. I found his jump to be pretty big. Every horse feels very different to jump, so it’s hard to compare Dante to jumping a real horse. The ascent was easy enough to stick with, but I found his descent and landing to really highlight my lack of lower leg strength as my leg slipped back and my body pitched forward. After seeing some professional riders jump Dante, I saw that their very strong lower legs helped keep them in place more effectively. A professional hunter/jumper trainer takes Dante around a course. One of the students Barbro instructs on the simulator has multiple sclerosis (MS). 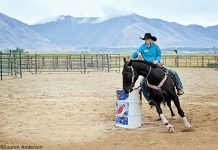 Though the student doesn’t ride real horses, she says that just 15 lessons on Dante have increased her range of motion and decreased her pain far more than her last 10 years of physical therapy combined. Although she prefers the safety of the motorized horse, his movements are so lifelike that his benefits appear to be similar to therapeutic riding on a real horse. The potential to develop simulators for this purpose are certainly intriguing. This is so cool! We need one of these closer to me. Hot damn. I want one, right now, installed in the study so I can ride Dante between hard bouts of writing. Though of course I’d want to be riding 3 and 4 star courses based on the real thing! Badminton, Burley, Kentucky, Luhmuhlen, Pau and of course Adelaide and the last Olympics! Oh and hold the dressage, not too much fun there. What a beguiling fantasy. Then of course I’d want a team of new horses on every course. Oh well, I’d better get back to sleep, life can be hard in the trenches. I need one of those guys, just so I can get my riding “fix”. Oh, I would probably get bucked off. These are so smart! They can be used for young beginners who are a little nervous about getting on a big horse for the first time or trying something new, like jumping! These are also great for experienced riders who have had a bad accident and are scared to get on a horse again because of the fear of getting hurt! You can also use them for practicing and improving your riding when your horse can’t be ridden temporarily!!! Oh, yes and you could use it to show parents who think it will be too rough for their child, how safe they will be and what they will learn! If I had a riding school I would definitely have one for every reason I listed and more!